New York University (NYU) is a private, nonsectarian American research university based in New York City. Founded in 1831, NYU is one of the largest private non-profit institutions of American higher education. University rankings compiled by U.S. News and World Report, Times Higher Education and the Academic Ranking of World Universities all rank NYU among the top 34 universities in the world. NYU is organized into more than twenty schools, colleges, and institutes, located in six centers throughout Manhattan and Downtown Brooklyn. 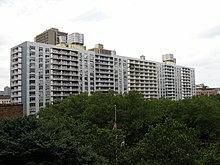 NYU's main campus is located at Greenwich Village in Lower Manhattan with institutes and centers on the Upper East Side, academic buildings and dorms down on Wall Street, and the Brooklyn campus located at MetroTech Center in Downtown Brooklyn. The University also established NYU Abu Dhabi, NYU Shanghai and maintains 11 other Global Academic Centers in Accra, Berlin, Buenos Aires, Florence, London, Madrid, Paris, Prague, Sydney, Tel Aviv and Washington, D.C.
NYU was elected to the Association of American Universities in 1950. NYU counts thirty-six Nobel Prize winners, four Abel Prize winners, four Turing Award winners, four Fields Medal winners, over thirty National Medals for Science, Technology and Innovation, Arts and Humanities recipients, over thirty Pulitzer Prize winners, over thirty Academy Award winners, as well as several Russ Prize, Gordon Prize and Draper Prize winners, and dozens of Emmy, Grammy, and Tony Award winners among its faculty and alumni. NYU also has many MacArthur and Guggenheim Fellowship holders as well as hundreds of National Academy of Sciences, National Academy of Engineering and American Academy of Arts and Sciences members, and a plethora of members of the United States Congress and heads of state of countries all over the world, among its past and present graduates and faculty. The alumni of NYU are among the wealthiest in the world, and include seventeen living billionaires. 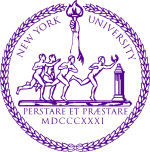 NYU's sports teams are called the Violets, the colors being the trademarked hue "NYU Violet" and white; the school mascot is the bobcat. Almost all sporting teams participate in the NCAA's Division III and the University Athletic Association. Albert Gallatin, Secretary of Treasury under Thomas Jefferson and James Madison, declared his intention to establish "in this immense and fast-growing city ... a system of rational and practical education fitting for all and graciously opened to all". A three-day long "literary and scientific convention" held in City Hall in 1830 and attended by over 100 delegates debated the terms of a plan for a new university. These New Yorkers believed the city needed a university designed for young men who would be admitted based upon merit rather than birthright, status, or social class. On April 18, 1831, an institution was established, with the support of a group of prominent New York City residents from the city's landed class of merchants, bankers, and traders. Albert Gallatin was elected as the institution's first president. On April 21, 1831, the new institution received its charter and was incorporated as the University of the City of New York by the New York State Legislature; older documents often refer to it by that name. The university has been popularly known as New York University since its beginning and was officially renamed New York University in 1896. In 1832, NYU held its first classes in rented rooms of four-story Clinton Hall, situated near City Hall. In 1835, the School of Law, NYU's first professional school, was established. Although the impetus to found a new school was partly a reaction by evangelical Presbyterians to what they perceived as the Episcopalianism of Columbia College, NYU was created non-denominational, unlike many American colleges at the time. What are the academic rankings for New York University? 1. number 35 for Academics. 2. number 101 for ROI (Return on Investment). What universities are similar to New York University?